Israeli soldiers shot, on Saturday evening, a young Palestinian man at the entrance of the al-‘Arroub refugee camp, north of Hebron, in the southern part of the occupied West Bank. Medical sources said the soldiers shot Mohammad ‘Ata al-As’ees, with a live round in his leg, causing a minor injury. They added that the soldiers fired many live rounds at random, while attacking protesters in the refugee camp, also causing many Palestinians to suffer the effects of teargas inhalation. 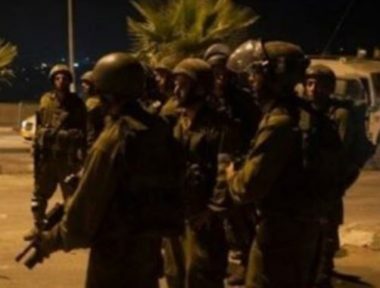 The soldiers also installed a military roadblock at the main entrance of Kharsa village, near Hebron, before stopping and searching dozens of Palestinian cars, and interrogated many residents while inspecting their ID cards. In related news, an illegal Israeli colonialist settler attacked an official of the Hebron Rehabilitation Committee, in the Sahla neighborhood, near the Ibrahimi Mosque in the Old City of Hebron. Furthermore, dozens of illegal settlers carried out a provocative march in the streets and alleys of the Old City of Hebron. On Saturday evening, a group of Israeli colonialist settlers attacked many Palestinian cars near Huwwara Israeli military roadblock, south of Nablus, in northern West Bank.